Search Results for "tamil nadu"
Video footage from the point of view (POV) of a car driver driving through the dangerous unlit night roads of rural Tamil Nadu. RANGANATHASWAMY TEMPLE, TIRUCHIRAPPALLI, TAMIL NADU, INDIA, FEBRUARY 2016: Busy street in India. Slow-motion slide shot. Drone footage of the Meenakshi Amman Temple complex in the center of Madurai, Tamil Nadu, India at sunrise with its 4 huge towers sticking out of the city buildings. The camera is panning over the city with the temple in the middle. Drone footage of the Arulmigu Dhandayuthapani Swamy Temple complex in Palani city, Tamil Nadu, India, believed to be the home of Murugan, a Hindu god, lowland behind and mountains in background. The camera is turning around the temple on the hill. Peoples Waiting at Local bus station and Beautiful public clock in old town on Tamil nadu, India. A stone with the image of the footprints of a guru on top of a mountain Arunachala. Top view of the Tiruvannamalai city and Arunacheshvara Shiva Temple from hill. Holy hill in Tamil Nadu. Top view of the Tiruvannamalai city and Arunacheshvara Temple. View of Indian Shiva Temple from hill. Beautiful Panoramic view of the holy city in Tamil Nadu. Spiritual and Religious of India. Texture of cracked ground Close-up. Background. Dry lake with Clay mud. Beautiful Landscape with a Withered pond. Arid desert landscape with cracked ground. Drought in the Indian state Tamil Nadu. TIRUCHIRAPPALLI, TAMIL NADU, INDIA, FEBRUARY 2016: The cows carries a cart on the street. Slow-motion tilt shot. RANGANATHASWAMY TEMPLE, TIRUCHIRAPPALLI, TAMIL NADU, INDIA, FEBRUARY 2016: Street with Hindu temple dedicated to Ranganatha. Ranganathaswamy Temple, Tiruchirappalli, Tamil Nadu, India. 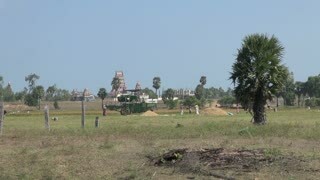 Hindu temple dedicated to Ranganatha. Close-up panning shot. RANGANATHASWAMY TEMPLE, TIRUCHIRAPPALLI, TAMIL NADU, INDIA, FEBRUARY 2016: Busy street with temple in India. Tilting shot. RANGANATHASWAMY TEMPLE, TIRUCHIRAPPALLI, TAMIL NADU, INDIA, FEBRUARY 2016: View from street. Tilting shot from monochromatic look to color grading. Ranganathaswamy Temple, Tiruchirappalli, Tamil Nadu, India. Hindu temple dedicated to Ranganatha. Close-up tilting shot.